Not long ago, we had a chance to meet with a few of the folks at HootSuite’s stylishly hip head offices in Vancouver. The people behind this cutting edge Canadian company have designed a platform which helps almost six million users effectively manage their social media networks. If you work online, you probably use it. In fact, HootSuite is growing like crazy around the planet and that growth can be attributed in part to Dave Olson – the company’s VP of Community. He, along with his tribe of community builders, travels the globe connecting with users and potential customers alike. 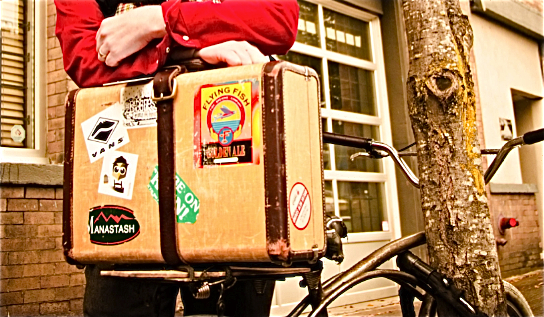 But Olson is an avid traveler apart from work which – aside from the fact that he has the coolest piece of luggage ever – makes him an ideal candidate for our latest In the Suitcase post. Q. Tell us, Dave, about your favourite suitcase. A. I have a tiny old hard shell suitcase with stickers all over it. It was actually made by prison labour on Alcatraz. It’s kind of fallen apart and I have to put a leather belt around it to hold it together. But it fits as a carry-on. And it’s a beauty. Q. Can you describe your travel essentials? A. I take the minimal in terms of clothes, thinking of them as a uniform. I always bring along a notebook. I have a pencil case with pencils and watercolours in it and I have an eye mask. I’m a horrible sleeper. All that goes in my backpack. In my suitcase, I take art or presentation supplies – depending on what I’m off to do. I always bring my spork and a little insulated lunch bag so I can buy things at the market. Picnics are what make travel awesome. There’s nothing like going to a French market and buying bread, cheese and wine and sitting in a park with the Tour Eiffel right there. Then you can keep the leftovers for later. Thrifty. Q. What do you never pack with you? A. I almost never take a camera because cameras put a barrier between people. People aren’t zoo animals. I do take an audio recorder. I record little sound-scene and audio adventures when I’m traveling. This whole kit packs into the size of a camera. Microphones invite people in. I like to have things with me that start conversations and build relationships. Q. How would you describe your packing style? A. Minimalist. Wherever you’re going, they have stuff. So I get to do things like go and find toothpaste in Japan. I pack comically light, renegade-style. Q. Are you a guy who likes to bring home souvenirs? A. I keep little ephemeral paper objects. Ticket stubs. Crappy postcards. I’ll take an empty scrap book and make it real time on the trip. Then you return home and BAM, the whole trip is documented and you can share it with your friends. I was on a train in the rain in Spain (ha ha) and had my scrap book with me and I ended up partying with all of these great folks. Great way to bridge those cultural gaps. I also like to bring back coins. Little things. I like tiny things. Q. What stands out as your most memorable souvenir from travels abroad? A. The first time I went to Europe as a 20-something-year-old – with $200 and no return ticket – I took a watercolour notebook and watercolour pencils. I made (a dozen or so) little paintings on that trip. To me, they’re more valuable than anything I could have hauled back. I don’t generally buy things and ship them back. But I do have a weakness for funny hats. Q. Any other must-have travel gear? A. I take one awesome pair of pants. A piece of rope and a little flashlight. You never know what’s going to happen. You may need a clothesline or you may experience a power outage in a strange country. Keep in mind, I don’t really travel four star. I don’t stay in fancy hotels. I feel out of sorts in those places. I’m much more of an oddball bed and breakfast or end of a dirt road guy. I’m a semi-professional couch surfer as well. Q. What do you think people’s personal packing style says about them? A. If you see people lugging around a bunch of stuff, you say ‘Rookie! Rookie! You don’t know what you’re doing!’ People get hung up on the details and expect to take their whole home life with them on the road. They take the same things and expect the same routine. I wonder why it is they’re leaving home at all. Then again, I’m the guy who brings all his art supplies and sits in parks and pretends he’s a painter. So I must live in a strange fantasty land. Q. What do you think your packing style illustrates about you? A. That I’m a delusional arts and crafts hippie. Q. Any more thoughts on your favourite suitcase? A. Well I have two of the old-time suitcases, and an old picnic basket. They’ve become trademarks when I travel and do my talks and community building efforts. People wonder what’s inside. It’s as if they think a clown is going to pop out and wave his hands! 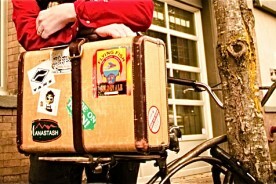 Oh yah, and when you travel with an old beat up suitcase? You’ll get searched by customs. Every. Single. Time. Thanks for this chance to share my stories. I am prepping for a trip to the backcountry of Jamaica and loading up the same kit i always do and taking all sorts of art supplies, sunglasses and pins for treats + art supplies and an audio recorder for documentation purposes. We loved meeting you Dave. Bring home a funny hat. Travel safe. And when you’re back, be sure to say hi to Ryan from Toque & Canoe!